The last few years of the country’s economic crisis have changed small businesses forever. They say the economy is bouncing back, but for many small businesses it is still a difficult time. Local Loyalty Rewards helps small businesses and the cities they’re in by promoting “Shop Local”. In shopping locally, tax payer dollars stay within the city, and help both small businesses and small towns thrive. Bring your loyal customer in more often and new customers in with incentives through our unparalleled 4 part Loyalty Program from Local Loyalty Rewards. Reach over 159,000 permission based subscribers (and growing weekly) online through our unique cross marketing with the Weekly Update, as well as drive more traffic to your website with a custom built profile page with links to your site as well as your social media campaigns, locations with map, printable coupons, and more. Look below for your solution. Build a database of Loyal Clients and Customers and bring them back for more! QR Codes can be placed in-store or in print advertising. 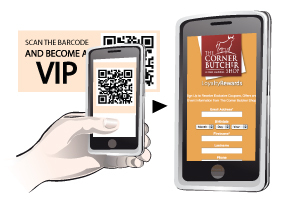 Codes can be scanned with any smartphone allowing customers to join instantly from their phone.